Well Water Treatment Bedford Hills NY | Water Treatment Service Bedford Hills | Drinking Water Treatment Bedford Hills	| Churyk Company, Inc.
We offer complete testing service. We will come to your home, pick up samples and deliver directly to the lab. We test for all water issues, including Bacteria, Lead, Radon, Uranium. When you own a home or business, water quality is of the utmost importance. Protecting your investment, while providing high quality, safe water is a priority. In our service area, we see a wide variety of water quality issues. Some areas have heavy iron and rust, while others have acidic water. We have areas with arsenic and uranium while some of our clients have multiple issues. We have also seen an increase in well water having heavy sodium and chlorides. Problem water will dissolve copper piping, plug up hot water systems and destroy appliances. Water with bacteria can make people and pets sick. We are experts at diagnosing these problems and providing solutions. We design systems for each situation, ensuring that we can solve whatever water problems are occurring. We will also only prescribe a solution when it is warranted. 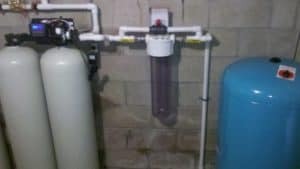 Many times a client will tell us that their neighbor has a water softener, so they must need one as well. This may or may not be the case. We recommend what is needed and will not recommend something that is not. Do you have municipal water? It isn’t always perfect. Water can be hard, damaging pipes, hot water heaters and dishwasher. Water can be over-chlorinated, causing dry skin, damaged hair, and poor taste. You do not have to live with poor-quality water. We can rectify these issues with simple treatment options.